Isn't this a little harsh? What if my internet gets cut off from me in the middle of a battle, or I have to find some snacks for my little brother? I think a better solution would simply be to alleviate the negative effects of AFKs, perhaps by allowing a dead tanker to commandeer the AFK tank...rather than punish people for something they may not be able to control. It does seem a bit harsh, honestly the time span is a bit over exaggerated. I think if it was done in hours it would be more adequate. "When placed in command, take charge." Need gear for my kayak anyway. Hours might not be a bad idea, like everything else, they can buff and nerf process, the length, etc. No, it's not too harsh! Quit making excuses for terrible players and players who constantly let their team down and are disrespectful to all teammates! A small bunch of bad, rotten apples should not be able to ruin the game for the majority of good apples. These bad apples have infected enough matches already, and their little charade is soon up. The game is going to be much better without this tiny minority of bad, rotten apples. Good riddance to them! And the same people who are the rule violators are many of the same people who like to say that it's just a game, to cover up for their obnoxious and disgusting in game behavior. Since it's just a game, then these people can not be complaining that it's too harsh, because they can't have it both ways. If it's just a game, then just deal with your ban and quit whining. Ok sometimes i'm interrupted in the middle of a battle and I have to go. This is too harsh. I mean they should at least do it if the player didn't move at all. If the person has moved that means they were just interrupted like me. Please WG the penalty is too harsh. Is it not amazing: we are all complaining about AFK all the time and about WG doing nothing? And as soon as WG actually tries to do something we are complaining again. I would pledge something just for the effort, but I have a strict Free2Play policy so I will just express my gratuities by simply thanking WG for listening to the users! Nope, if you can't play uninterupted then dont play. I personally put my Iphone 6+ on "Airplane Mode" whwn I play. That way someone cant call and drop me out of game. You're telling me that random crap never happens to Your Royal Highness over here? Are you here to tell me that you have, not once in either your OMK acc or this one, been forced to leave or stop mid-game due to reasons outside your control? If so, we are so terribly sorry that we do not have godlike control over our environment unlike you, my great master of World of Tanks Blitz. We are so sorry we may have family who we need to tend to, or Internet that's not quite as stable that your picture-perfect technological powers can withhold over yourself. Stop with all the "don't play if you can't play" horse crap. I can't always control when I "can play" nonstop. It's not as simple as "play at home, not at work" - even at home I have tasks which may always be thrust upon me, especially babysitting my little brother at unexpected times. If you have no responsibilities like this, then shut the HELL up about us being lazy. Good point I added a My Gratitude option to the poll. You're telling me that random crap never happens to Your Royal Highness over here? Are you here to tell me that you have, not once in either your OMK acc or this one, been forced to leave or stop mid-game due to reasons outside your control? If so, we are so terribly sorry that we do not have godlike control over our environment unlike you, my great master of World of Tanks Blitz. We are so sorry we may have family who we need to tend to, or Internet that's not quite as stable as your picture-perfect technological powers can withhold over yourself. You wrote that you might have to find some snacks for your little brother? Seriously? Blitz matches are pretty short. Are you telling me that they're going to die from hunger if you don't drop everything that you're doing and that they can't wait a minute or two? Or here's an idea. Give snacks to your little brother, or whoever it might be before any matches begin. I'm sorry, but the excuses that some people are coming up with are just beyond ridiculous. And of course I have been AFK on rare occassions before. This new system is not meant to punish a rare AFKer I believe, it is meant to punish the serial AFKers. So if you need to leave a match to find some snack for some little brother once, then that's totally fine I'm sure. If you need to leave matches every single day or multiple times a day to do that, then hell yeah, you should be punished, because that would make you a serial AFKer, and ALL serial AFKers are bad people and bad players, no matter what excuses they might come up with. Edited by player_1234567890, 02 July 2015 - 08:58 PM. Hey what if my parents tell me to eat dinner? What if your using an Ipad air 2 that doesn't have data? See that i'm saying? So if you need to leave a match to find some snack for some little brother once, then that's totally fine I'm sure. If you need to leave matches every single day or multiple times a day to do that, then hell you, you should be punished, because that would make you a serial AFKer, and ALL serial AFKers are bad people and bad players, no matter what excuses they might come up with. I'm sorry, but you would be the most atrocious, miserable, and pathetic excuse for a father if you ever had children. Putting a video game over your own family? How about you try playing with a 10-yr-old banging on your door and wailing? You're going to have Child Services marching up to your doorstep within two months of your firstborn coming home if you go abide by your own reasoning. Never mind, I should not even bother speaking to someone like you; perhaps someone of more rational or mature mind will comprehend what I am saying. 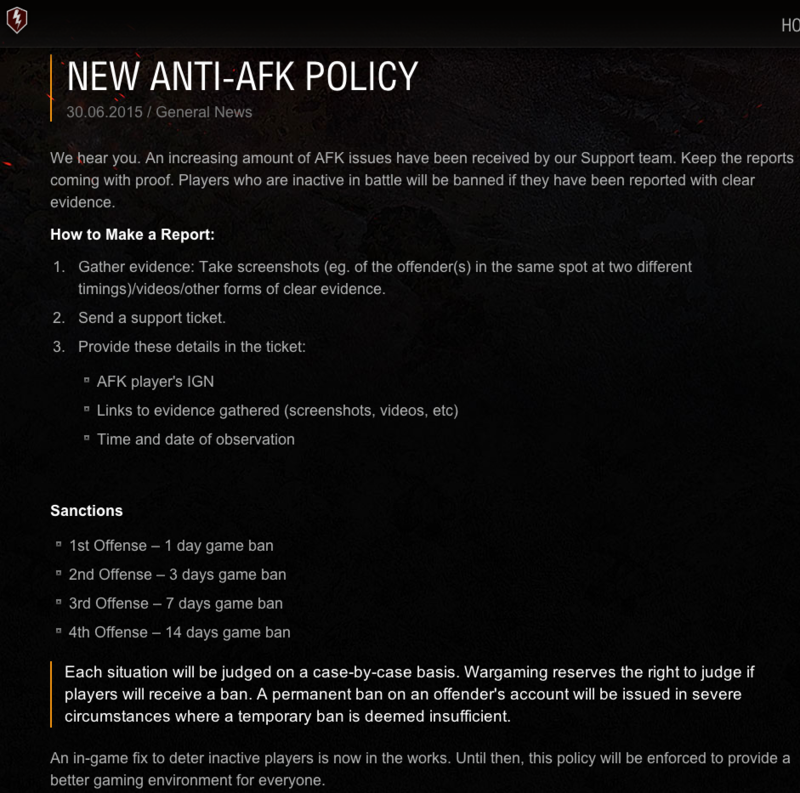 Edit: Furthermore if you really have been AFK on several occasions then you should be permabanned by your own logic. Yes, because some people value family over a game. Do you know how children act? They will make you drop everything and do what they want if they're persistent, and no point of arguing about it. Don't be such a d1ck about this, you said if he had to get snacks for his brother twice he should be punished? No wonder no one ever liked you. And OP, good thread, sorry about that. I don't wanna sidetrack it, I cant really pledge to buy anything, but if WG listened to the players of NA and implemented something similar I'd highly respect them. I would like to see some sort of a system - but there has to be a grace period or reset of some sort. I'm, a father - I have a 5 year old and twin 3 year olds. Sometimes I have to bail - that's life. That is occasional and should not be punished. It is only repeat offenders who do it intentionally that should be punished. Sometimes the CINC House needs something ... gotta bail. If I am to continue to play and spend $ with Wargaming then I need a LITTLE bit of slack. One of the things that's great about Triarii is that many of us are parents and all of us understand... even platooned it's cool that sometimes you gotta vanish. We usually type a quick thing to apologize or at least let people know. Im not saying it doesnt ever happen. I am saying try and limit the times to play to the least possibility of distractions. I have two kids myself, I work at a firestation. So I do not play unless the kids are sleeping or if I am at work. Could u allow us to choose multiple options? A lot of people here are parents or older siblings, like myself...WG needs to cut these guys some slack if they need to go change a diaper or tend to a child's needs in the middle of a game and go afk for ~5 minutes. Most people who go AFK in-game aren't even doing it with malicious purposes (now OMK notice how I said most - i even bolded it for you!). Why are you punishing them for something they had no control over? Admittedly there does need to be some sort of system about AFKs, but slamming the banhammer down on everyone who had to tend to real-life before a video game is not the answer. Blitz Staff Corner → Suggestions & Feedback → Anti-AFK not working. Please perma-ban the botters ASAP.